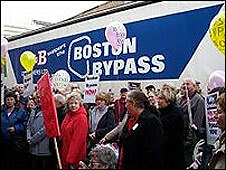 A Lincolnshire council elected to secure a town bypass is being criticised for not achieving enough. Independent councillors took control of Boston Borough in last May's local elections promising to solve the town's long-running traffic problems. Critics have said the town is no closer to getting a major road scheme than before they took over. But the council's leader, Richard Austin, said progress had been made and they remained focussed on their goal. The issue of a relief road had come to the fore after years of increasing complaints about congestion in the town. An 11,000-signature petition supporting the bypass handed in to Downing Street in March was just the latest in a series of moves to push the campaign forward. But councillor Brian Rush, who left the Bypass Independents but remained on the council, has claimed nothing concrete has been done. "We came in on a typhoon and we are nothing more than a gentle breeze now. "It appears to me that we haven't done anything yet. There is nothing that I can put my hand on and say the BBI (Boston Bypass Independents) have thought of that, the inspiration was there and they have carried it through. "It seems to me they are just completing the job they castigated other people for." But Mr Austin rejected this: "We have worked hard with the county council to improve traffic flow through the town. "We have managed to persuade them to switch off traffic lights on the two major roundabouts and modify junctions. "This helps until we can get an outer relief road built - which will take a lot of time." There are no seats on Boston Borough Council to be contested in Thursday's local elections.